CAMBRIDGE - Like most other people who step inside for a quick drink and stay for a lifetime, ex-Morphine saxophonist Dana Colley claims it feels like forever since he first set foot inside the Plough & Stars. Since first coming to the cozy little corner bar as a customer around 1980, Colley has frequented its cramped cosmos innumerable times, many of those in one musical configuration or another. It was here that he met fellow Plough regular and future Morphine bandmate Mark Sandman when Sandman was leading Treat Her Right. Colley says he’s been at the bar ever since. More than a few folks - the famous, semi-famous, and famously eccentric - have called 912 Mass. Ave. home over the years. Philip Roth wrote and drank within its red walls. Bonnie Raitt played guitar and forgot her keys here. The esteemed literary journal Ploughshares even nicked its name from its founders’ favorite haunt (one of the Plough’s longtime owners, Peter O’Malley, is on the journal’s editorial board). To mark the pub’s 40th anniversary, the Plough is hosting a three-day birthday party commemorating the myriad musicians and musers who have crossed its threshold. 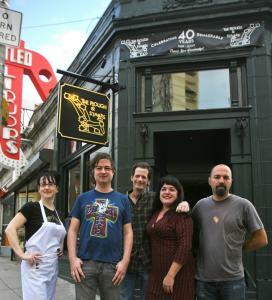 Co-owner Jennifer Lockwood grew up among the Plough’s people. Her mother, Margo Lockwood, a poet, contributed to Ploughshares and hung out with O’Malley back in the ’70s. When the bar closed in 2005 for nine months its denizens would prefer to forget, everybody wondered whether memories were all that would be left. But a series of coincidences led O’Malley to ask whether Lockwood and her boyfriend, Brendan Curtis (both restaurant business veterans), would be interested in taking the reins of the financially troubled venture. Lockwood says they did not take the mandate - to preserve the bar’s history and honor its tradition - lightly. Veteran drummer Larry Dersch was heartsick to see the Plough shutter its doors because of noise complaints (the walls have since been soundproofed) and tough financial times. THE PLOUGH & STARS 40TH ANNIVERSARY PARTY Featuring Family Jewels, Andrea Gillis, and more, begins tonight at 9 and continues through the weekend. Free. Go to www.ploughandstars.com for details.